Pet rescue 528 is a really complicated one. You have to destroy the two metal boxes under the first pet with the bomb right of them. Use the paint brush booster there is between them to get helped. After that release and use the key to destroy the locked blocks. 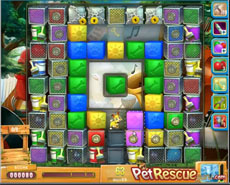 After that the difficult point of the level is the wired blocks that prevent pets’ rescuing. To make it easier use the paint brush boosters of the level to clear blocks beside them, under them, etc to smash the wires. Bombs and balloons of the level will help you to save moves rescuing pets with a move. Watch the victorious strategy in order to complete pet rescue level 528, without using any boosters.